After a serious accident and a failed back surgery afterwards, Bernardo Bertolucci lost the ability to walk and he also lost his will to direct again. He decided to isolate himself for a long period so his directorial return nine years after his previous work, The Dreamers (2003), came as a pleasant surprise for all of his fans but also raised some questions for the final result. Io e Te (Me and You) is a slightly low budget drama for Bertolucci’s standards and premiered out of competition at the 65th Cannes Film Festival. Lorenzo (Jacopo Olmo Antinori) is an introversive neurotic disturbed 14-year-old boy who lives with his mother Arianna (Sonia Bergamasco). Lorenzo hates school; he can’t communicate with his mates and prefers his own world of music and books. His mother sends him to a psychologist in order to help him with this situation. When the school organizes a skiing week trip, Lorenzo decides not to go and instead he is secretly preparing to spend this week alone hidden at his building’s basement. His idyllic week of solitude is disturbed by the sudden appearance of his twenty something heroine addicted half-sister, Olivia (Tea Falco). When she finds out his hideout she demands to stay with him since she’s homeless. So they should spend the following days together hidden in this small basement. Bertolucci’s return is pretty interesting since he chooses this powerful claustrophobic coming-of-age drama that could seem limited in space but works quite intrusively. Taking as a preface the story of these two young people, the director following his past, builds a mystery around them. Theoretically Lorenzo and Olivia are siblings but they don’t know each other that well. They could also be friends, but they don’t really share the same thoughts and ideas. They could be simply two strangers that spend a couple of days together by chance. They could be even lovers since there is passion and strong feelings between them and a hint of latent incestuous love. At the same time they seem so different so the one could be the flipside of the other in order to complete each other. The point is that there is no need to know what exactly is happening between them since even they can’t realize it. They are both confused, Lorenzo for being a teenager and Olivia for being a drug addict. Bertolucci’s vision cuts through the usual labels and stays focused on his heroes’ psychism. He prefers to stay as confused as they are; he doesn’t try to observe them from above as a senior or to give a solution or a lesson. The helmer just lets himself and his camera to be swept away by these youngsters probably because he wants to feel as innocent and free as they do. Certainly Io e Te is not Bertolucci’s masterpiece and nobody would expect something like that. Although it is extremely impressive that a 72-year-old director stays so close to the teenage cinematic genre and that he could attract audience of that same age. Of course he is not limited just in that. He also reminds us his acclaimed previous work even with fractions of camera movements that are allowed in so strict spaces and by keeping always present his favorite element of intrusion. 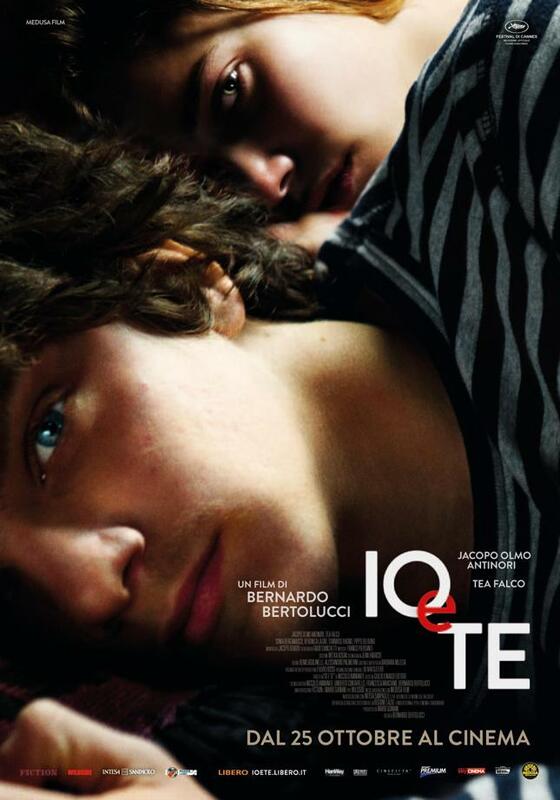 Io e Te is an adaptation of Niccolò Ammaniti’s homonymous latest novel and Bertolucci collaborated with him in writing the screenplay. Since the story is quite linear, then everything is based on the emotions and of course the only way to transmit these is through the protagonists’ performances. Fortunately, film’s cast seems impeccable. Jacopo Olmo Antinori in his first ever role on screen, stays to the point without giving the feeling of a child but he rather looks so mature. Tea Falco, or as Bertolucci calls her “the little Marlene Dietrich from Sicily”, is so realistically convincing and she doesn’t fall into tedious reprises that could weaken he role. They both coexist and blend beautifully and they literally carry the film. As it could be supposed, Io e Te has of course some disadvantages that could be easily spotted but at the end of the film they seem so minor or simply too technical. Bernardo Bertolucci decided not to play safe by creating a pretentious exaggerated film to draw some attention. He also abandoned his initial intentions to shoot the film in 3D since he thought that this would be a vulgarly commercial decision. On the contrary he delivered an honest straightforwardly emotional youth drama with some melodramatic pinches and by covering it with David Bowie’s music he made it speak contemporarily to today’s adolescents and to his generation’s youth as well.